The Architecture/Landscape/Interiors Department at OTIS College of Art and Design is pleased to announce a lecture by Gerdo P. Aquino, CEO of SWA Group, on Thursday, September 17, 2015. The lecture will begin at 7:00pm in the Forum, Ground Floor, Kathleen Ahmanson Hall, Elaine and Bram Goldsmith Campus, OTIS College of Art and Design, 9045 Lincoln Boulevard, Los Angeles, 90045. Gerdo P. Aquino, RLA, FASLA, Assoc. AIA, is CEO of SWA Group. SWA Group (SWA) is one of the nation’s leading landscape architecture, planning and urban design firms. Throughout its 55+ year history, SWA has embraced the idea that planning and design can shape the environment in fundamental ways. Our practice is a constant search for a better approach, or more interesting and informed response, to the wide array of urban and regional challenges brought to us by our clients. 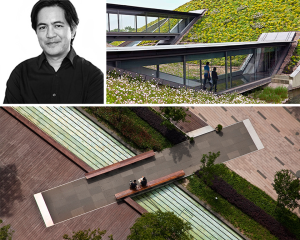 Gerdo P. Aquino is an urban designer and landscape architect with 20 years of experience in the planning, design and construction of public and private projects throughout the United States, and internationally. Since joining SWA in 1996, he has had much success in solving a wide range of environmental landscape design problems for projects where open space, density, and place-making are key issues. Aquino is also Adjunct Associate Professor in the Landscape Architecture Master’s Degree Program at the University of Southern California where his design studios focus on landscape infrastructure and its application to urban areas challenged by issues related to density, environmental degradation, health and accessibility. In January of 2011 Birkhauser released a new book entitled, “Landscape Infrastructure: Case Studies by SWA,” co-authored by Gerdo, that encompasses much of his current thinking in landscape architecture professionally and academically.